Want to know how to win at Christmas while keeping it local? Then get yer peepers ‘round the Exposed Christmas Gift Guide. 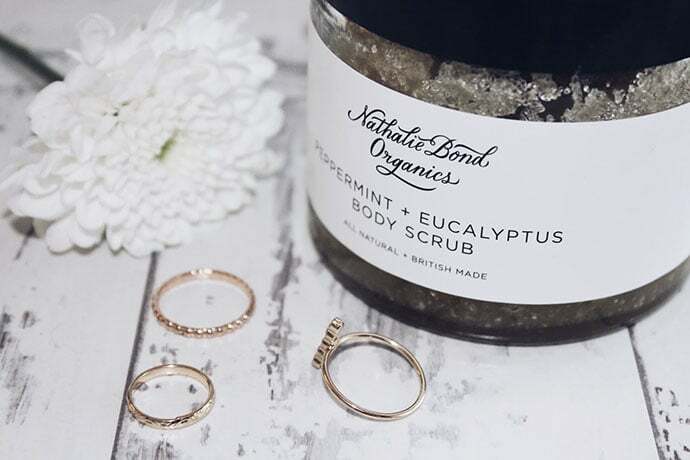 Nathalie Bond Organics was founded in Sheffield two years ago and offer a range of quality gift sets, perfect to treat all those special women in your lives this Christmas. Their Ultra Gentle Gift Box is ideal for those who relish life’s more natural amenities – and great for ladies with sensitive skin! The collection of unscented products is crammed full with milder goodness like goats’ milk, apricot kernel and jojoba oils. Ferndale Garden Centre may not be the first place you think of when you’re planning on buying a Christmas present, but don’t discount it. 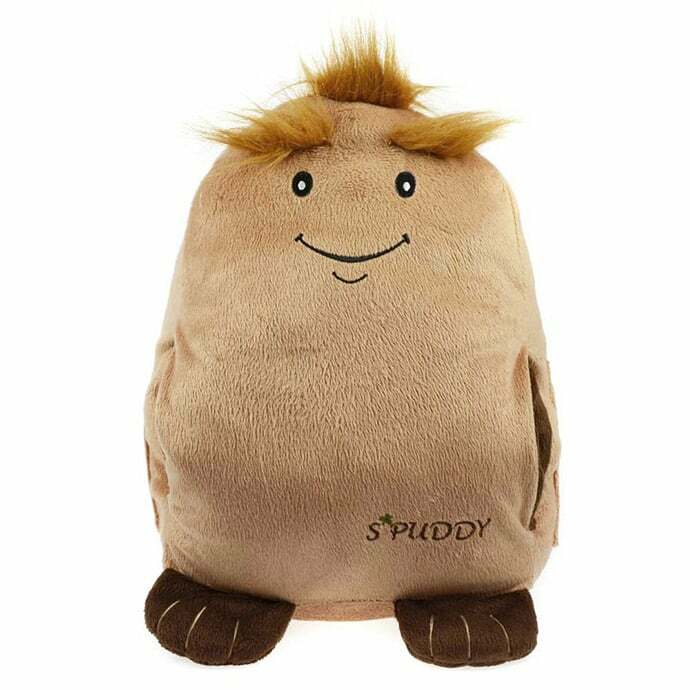 Among the array of Christmas trees and fairy lights sits these couch potatoes or “Spuddys” as they are affectionately named. Spuddy perfectly stores all the daily essentials of a man’s life: phone, remote and beer – all within easy reach as he whiles away the hours on the couch. Slotted away on Chapel Walk in the city centre sits a haven of handcrafted specialities, offering trendy goodies from quirky jewellery to woollen blankets. Bird’s Yard is a practical paradise for your quirky friends who would appreciate handmade and eye-catching gifts. Our favourite is the very affordable Melodies collection, which is an assortment of products using vinyl records to create things such as dangly earrings and fancy notebooks. Check it out. We all know one of those people who seems to have everything already, so instead of another smelly candle, why not buy them a nice time this Christmas? Spa 1877 provides a range of luxury treatments and spa days for both men and women. Featuring a restored Victorian Turkish Bath, a day here promises to be a real and unforgettable treat! The spa is hosting its annual Christmas shopping event on December 3rd, which not only includes information on the products and treatments they provide, but also mini-treatments and demonstrations, making buying the most-suited gift a lot easier! 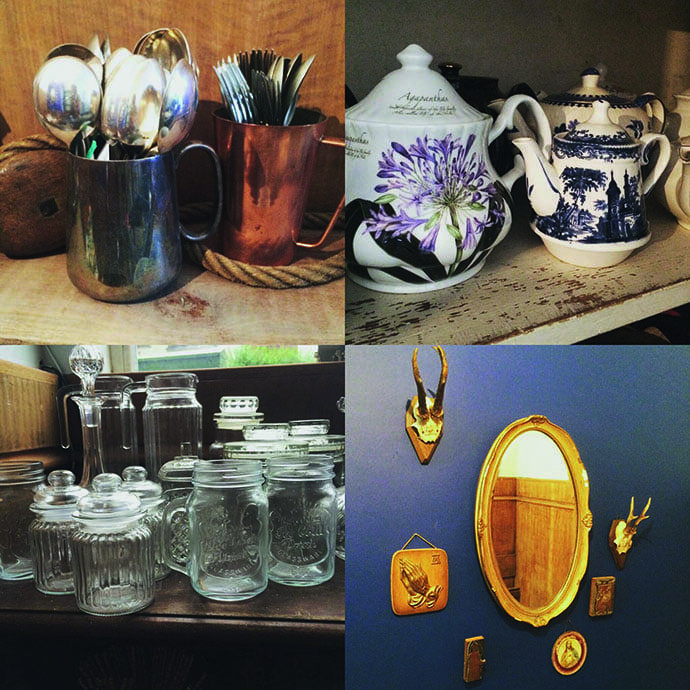 Lily Moore interiors are a small establishment located on Sharrow Vale Road, heaving with beautiful vintage inspired pieces for your home and garden. Contained in this glorious shop are some magical handmade boxes built here in England from reclaimed wood. 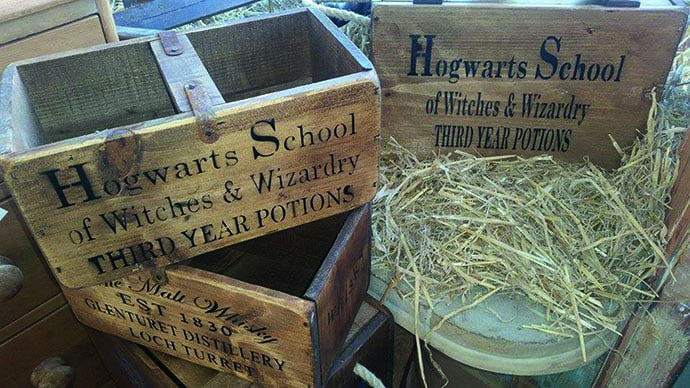 The Harry Potter box is perfect for those thoroughly invested in Pottermore, and ideal to cram with stationery and other bits and bobs that need a place to be stored away. 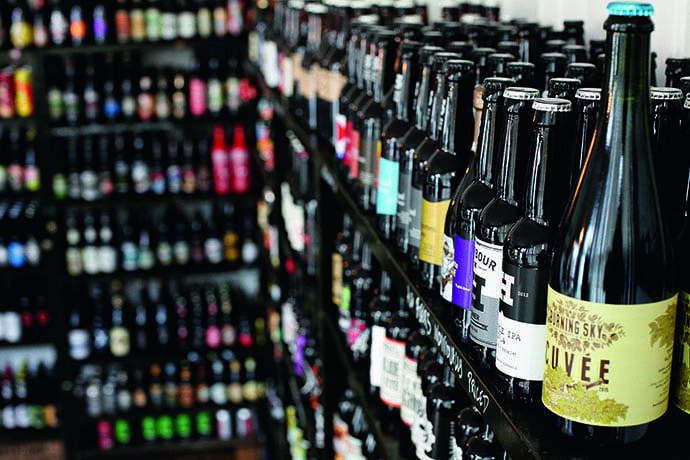 Nestled within Sheffield’s antiques quarter, Hop Hideout is an ideal establishment to stock up on gifts for those who openly embrace the thriving craft beer scene. The shop provides all customers with a free gift wrap service, making it easy to bundle together a variety of different beers and ciders. You could even include some of their Christmas specials to really make things really festive. Their ‘Mary Christmas’ amber ale festively spiced with cinnamon and nutmeg, and the Belgian Christmas classic ‘Bush Noel’ would both be great shouts for festive tipples. Throw in one of their tote bags or branded half glasses, and you’ve created the perfect gift hamper this Christmas time. Sarah Waterhouse is a local designer here in Sheffield and creates some wonderful hand-printed textiles all on sustainable, organic cotton fabrics. Handmade in her city centre studio, the Sheffieldish tea towel is a perfect present for those proud of their heritage. Sold at the Millennium Gallery’s shop or on her website, this is not only thoughtful, but also a useful gift. Cocoa Wonderland located on Ecclesall Road is a heaven on earth for those with a sweet tooth. A dream come true for the two best friends that run it, this gem of a shop caters for all those who simply love and adore the sweeter side of life. This Christmas, Kate and Anne are crafting some very special treats for their customers. Their beautiful bird boxes are being crammed full of new chocolate creations, exploring classic flavours such as rum, raisin and eggnog. 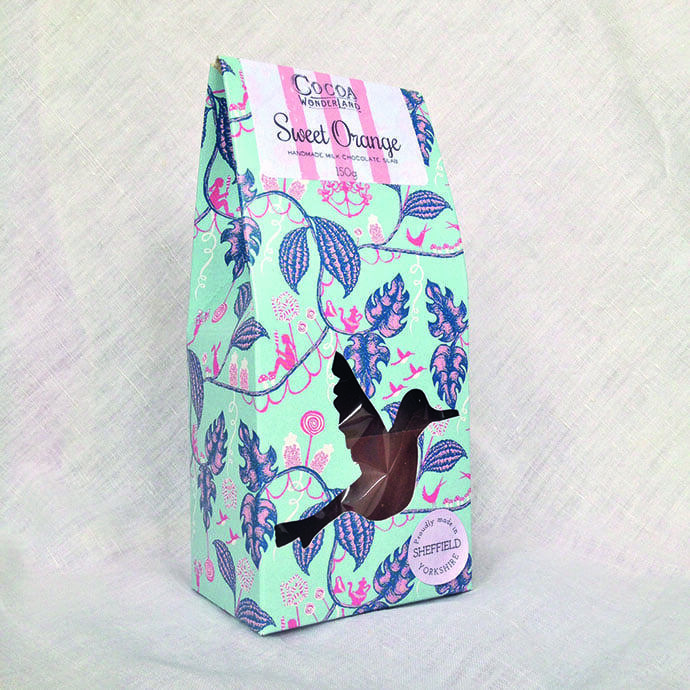 Boxes are priced at £6 and make for tasty stocking fillers for all the chocoholics in your life! MoonKo is one of Sheffield’s best known hotspots in terms of independent, ethical products and gifts. Among their wide range of creations is a collection specifically designed for children. This includes the work of Donna Wilson whose assortment of quirky animal toys and modern take on the traditional rocking horse – “Hobby Horse”- is sure to provide hours of fun for all the young’uns. 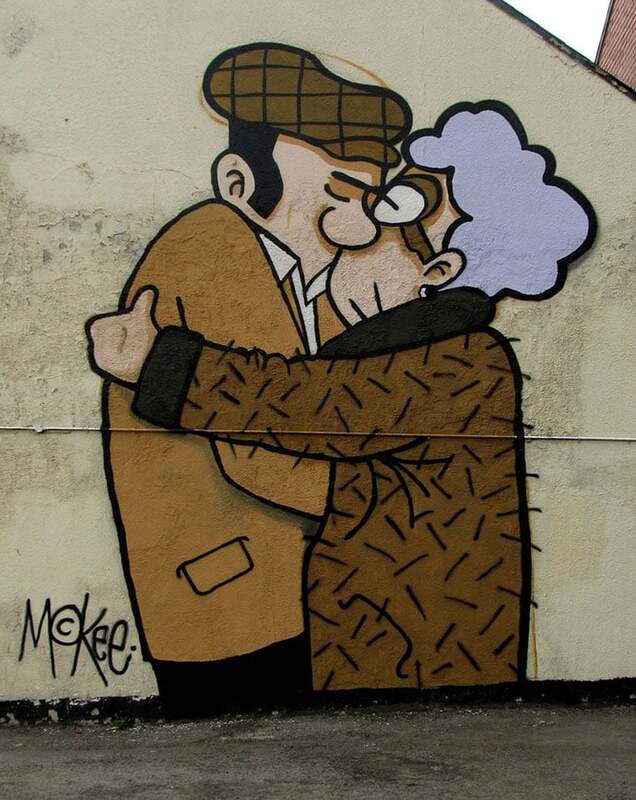 With his brilliant takes on Sheffield culture, a Pete McKee print is a perfect present for Sheffield art fans. His Sharrow Vale Road Gallery now boasts a vast collection of not just prints, but books and all manner of accessories and objects. His collection of iPhone cases are an optimum choice for all social media enthusiasts or ‘The Snog’ tea towel, which features the same image painted on Fagan’s pub on Broad Lane, could be a great stocking filler for yer mam! Colouring books for adults are becoming increasingly popular as a relaxing pastime away from the technological swirl of modern life. Sheffield’s Deckle Edge stationers supply a range of colouring books for adults, a perfect gift for those who could do with a bit of chill time. Sunshine and Blooms publication designed by Rachel Ellen is only £2.99, and will drop into a stocking brilliantly. There is no longer a need to scramble over the Cork and Kerry mountains to get some whiskey in the jar. Over at StarmoreBoss on Sharrow Vale Road, they have created it all for you and for only £10! 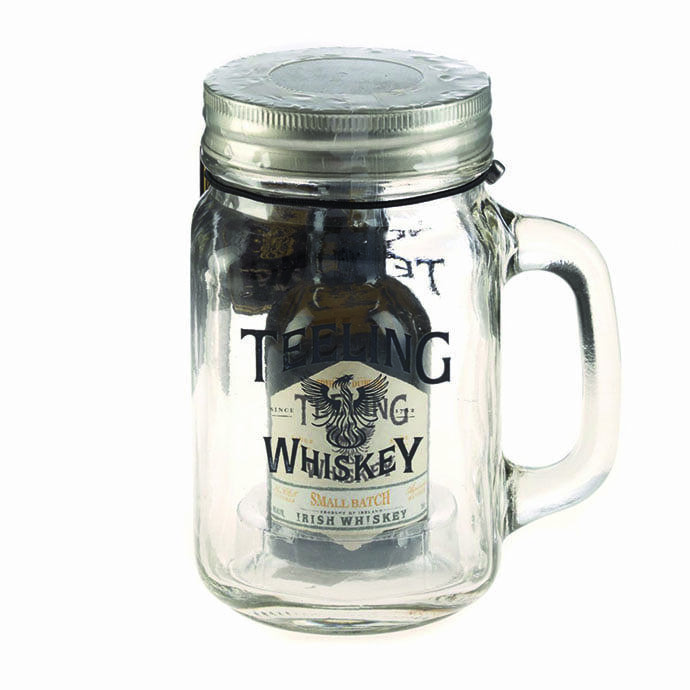 This screw-top jam jar is filled with an award winning miniature of Irish Teeling whiskey, known as the Spirit of Dublin. Perfect for those partial to a wee dram. Sláinte! If you are looking for a floral gift this Christmas, instead of grabbing another last minute bunch of flowers from the supermarket, head over to Plantology on Division Street. This Christmas they are providing some wonderful festive treats for customers. 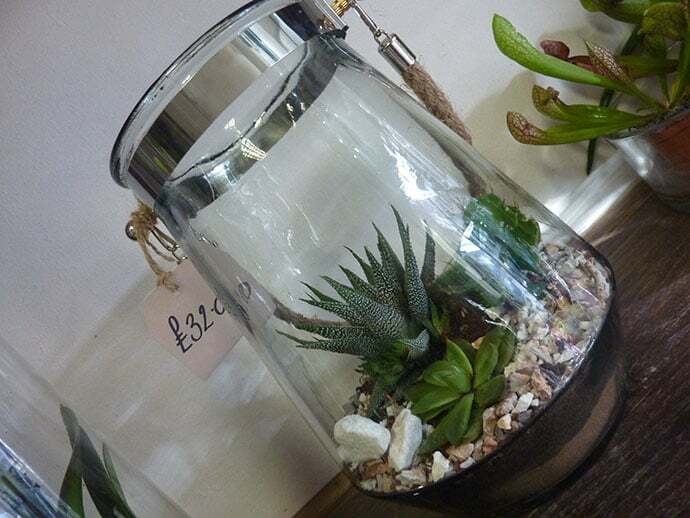 This includes a quirky Vintage Cup and Saucer set for £10, the cup cleverly providing home for the potted plant, as well as our personal favourite the Airplant Bauble, which sees the shrub take centre stage in a spherical, glass ball for a very reasonable £12.50! Tarr and Fether provide classic, timeless pieces of jewellery, all produced in Sheff. They also offer a range of necklaces, bracelets and rings that can be personalised with letters or numbers of your choice. Great for those wanting to impress someone special this Christmas time. Award-winning farm shop Beeches of Walkley has plenty of foodie offerings to fill your belly/stockings this year. Their special Christmas hampers range from £7-£40, and you can fill the straw-woven baskets with your pick of special marmalades, jams, chutneys, cooking sauces and honeys. There are also environmentally-friendly soaps and toiletries to add, or if you’re feeling a bit lazy, simply take a pick from the ready-made sets! Vintedge, a jewel in Sheffield’s Antiques Quarter, is a treasure trove of retro goodies offering clothes, records, furniture and all other manner of curios. Ideal for those who like a good rummage and perfect for those friends who would appreciate the effort gone into finding that ideal, if not eccentric, Christmas gift! If you need an event to get all your friends or work colleagues together over Christmas, The Great Escape Game in Sheffield would be an ideal choice. Voted number 1 on TripAdvisor, this immersive experience – based loosely on the British game show Crystal Maze – aims to test the participant’s common sense as well as logic. With prices ranging from only £15 per person, give them a real challenge this Christmas!